Thanks to Dr. Jatin S. Gandhi, Consultant at Rajiv Gandhi Cancer Institute and Research Centre, New Delhi (India) for contributing this case, Dr. Belinda Lategan, St. Boniface Hospital, Winnipeg, Manitoba (Canada), for editing the discussion, and to Dr. Genevieve M. Crane, University of Rochester (New York) for her review. To contribute a Case of the Week, first make sure that we are currently accepting cases, then follow the guidelines on our main Case of the Week page. 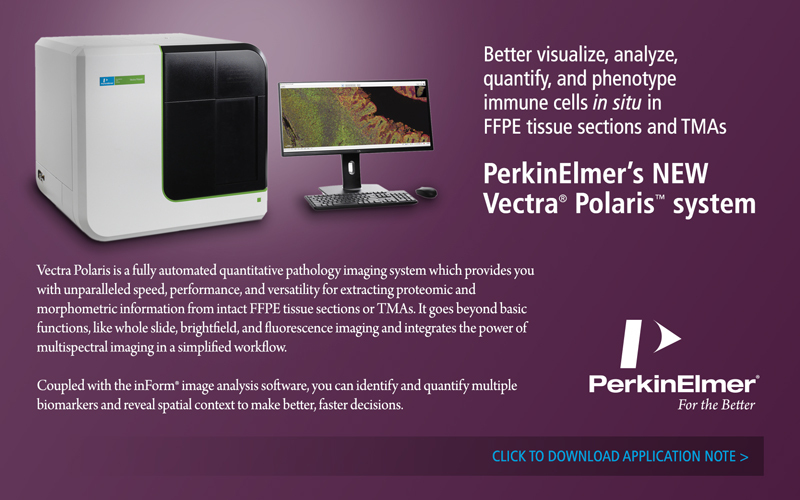 (1) At the beginning of October, we saw a record 322 jobs posted at PathologyOutlines.com. We try to make our Jobs page as useful as possible, and appreciate the response of our advertisers. Where are all the cytopathology jobs? Scroll down to Regional totals by subspecialty, just below the subspecialties, and pick cytopathology from the drop down menu. Scroll down to see the totals, which are followed by summaries of the ads, followed by the full ads. (2) See the most recently updated topics here. These are posted regularly on our blog. (3) We have enlarged the text at the top of the header, making it easier to see. Also, we have moved the Get Involved information to the Contact Us page. A 37 year old woman presented with recurrent vomiting and abdominal pain, with workup suggestive of gastric outlet obstruction. She underwent an open subtotal gastrectomy. What is the most commonly occurring lymphoma of the stomach? 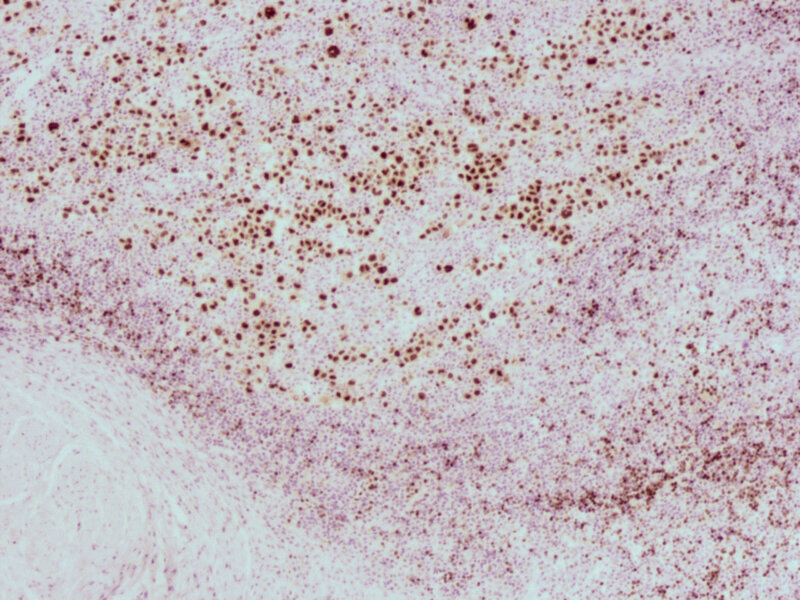 The stomach is the most common site of primary gastrointestinal lymphomas. 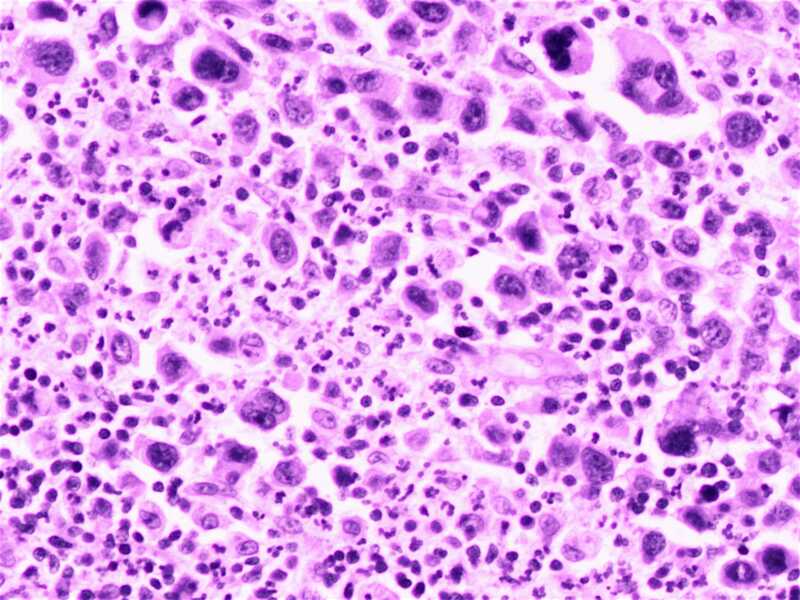 The vast majority of gastric lymphomas are diffuse large B cell or extranodal marginal zone (MALT) lymphomas, which together account for up to 50% of all cases. In contrast, primary gastric classical Hodgkin lymphoma is extremely rare (< 1%) (J Korean Surg Soc 2012;83:111). (e) no lymphomatous involvement of the liver or spleen (Br J Surg 1961;49:80). 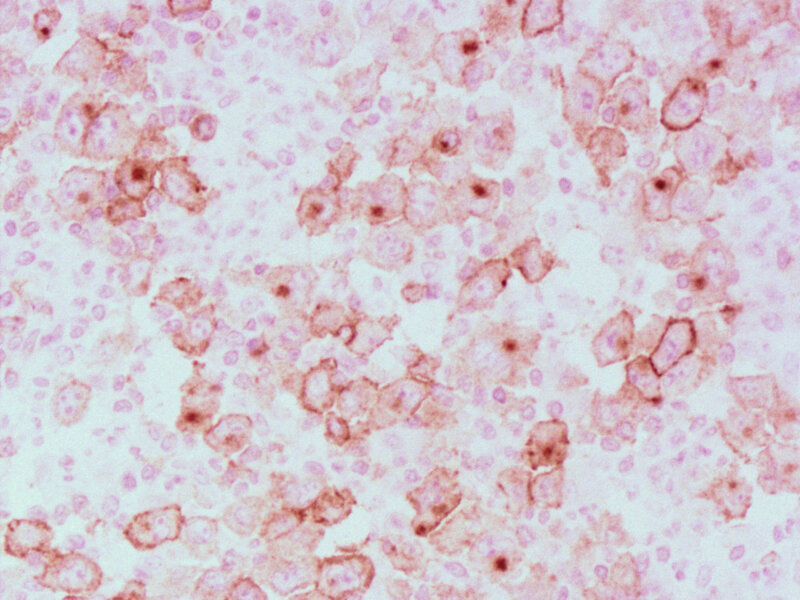 Akin to Hodgkin lymphoma (HL) in nodal sites, gastric classical Hodgkin lymphoma is characterized by mono- and multinucleated tumor cells (Hodgkin and Reed-Sternberg cells / HRS cells), which are rimmed by rosettes of T lymphocytes, all in a heterogeneous background of nonneoplastic inflammatory and accessory cells (WHO Classification of Tumours of Haematopoietic and Lymphoid Tissue, IARC 2008). 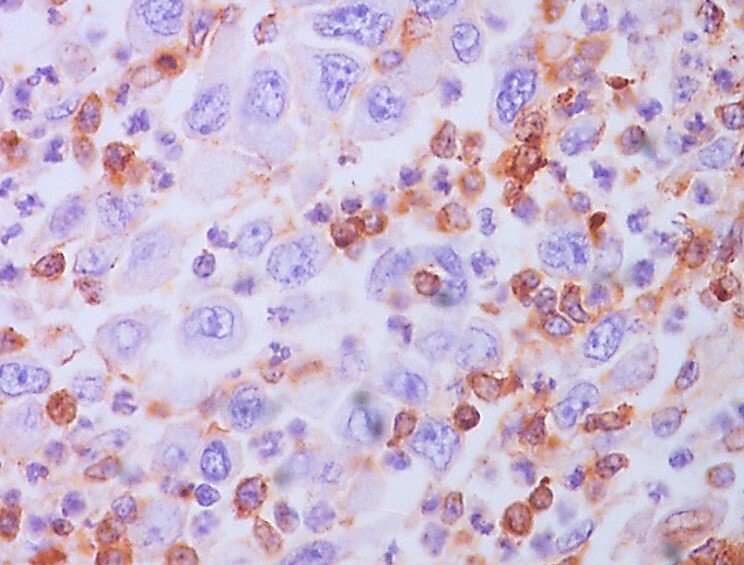 As illustrated in this case, HRS cells are highlighted by CD30, and to a lesser extent, CD15 (the CD15 staining in this case appears questionable). T cell markers (e.g. CD3) demonstrate T cell rosettes around the HRS cells. 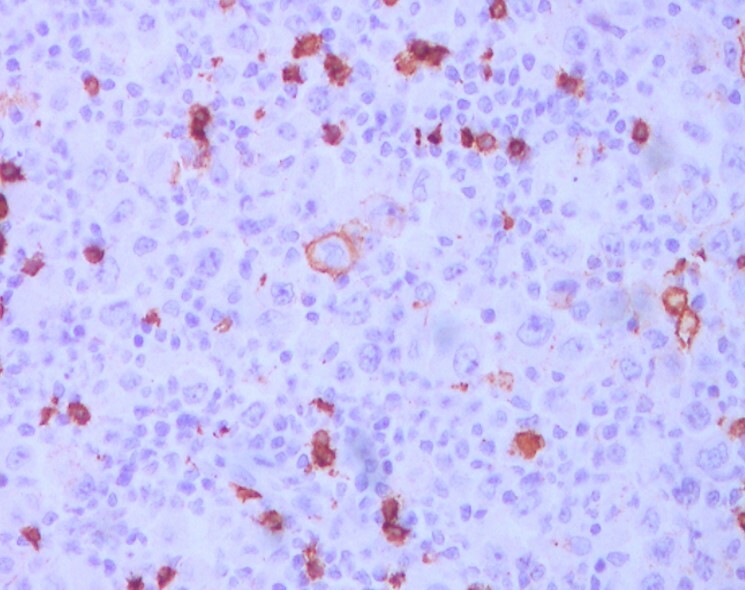 Although up to 60% of Hodgkin lymphoma cases overall demonstrate EBV DNA sequences by EBER - ISH, this case was negative (Arch Pathol Lab Med 2002;126:1534). 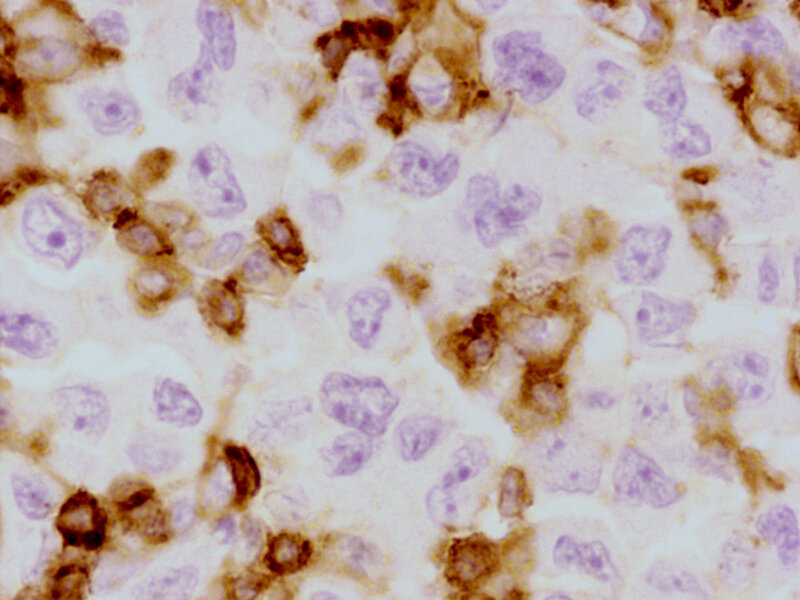 The tumor cells were negative for ALK and CD79a (images not available). This is a difficult case to classify. 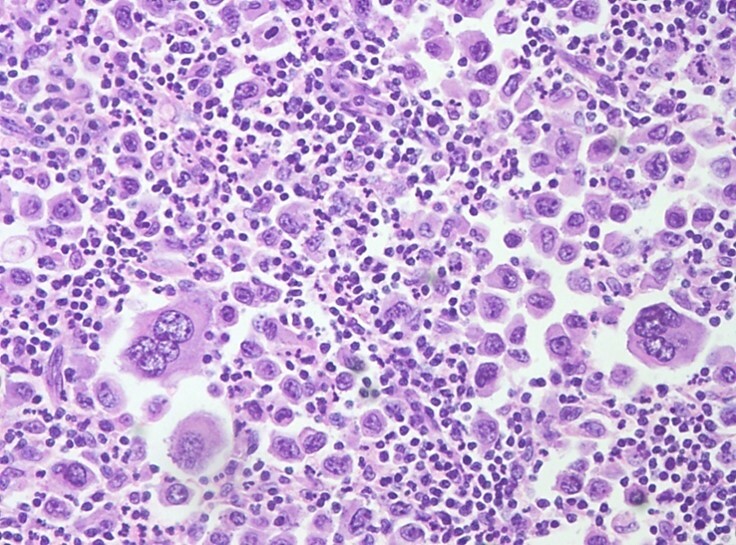 Arguments against the diagnosis of primary gastric Hodgkin lymphoma are: (a) the tumor cells are not typical for HRS cells; (b) gastric classical Hodgkin lymphoma is exceedingly rare, compared to the more common diffuse large B cell lymphoma and marginal zone lymphomas; (c) although the tumors cells are CD30+, they do not appear to be CD15+; (d) PAX5 is brighter than typical of Hodgkin lymphoma; (e) the negative EBER - ISH is not specific, but if positive, would be more suggestive of Hodgkin lymphoma. 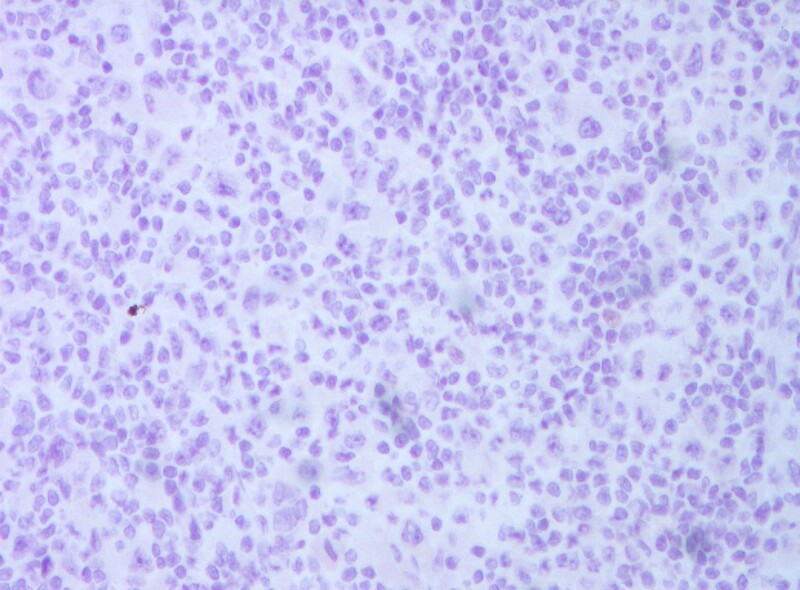 Other possibilities include an unusual diffuse large B cell lymphoma or transformation of a marginal zone lymphoma. 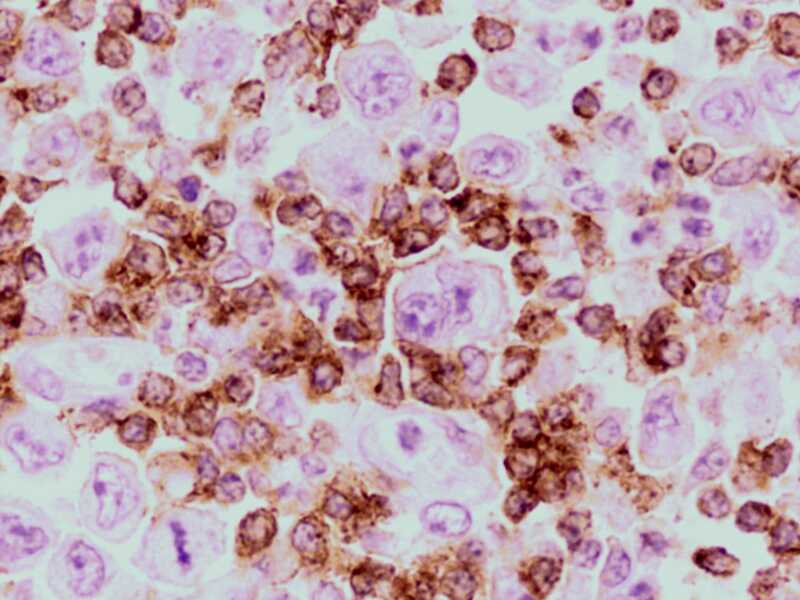 Anaplastic large cell lymphoma is unlikely due to the PAX5 staining and the slight CD20+. 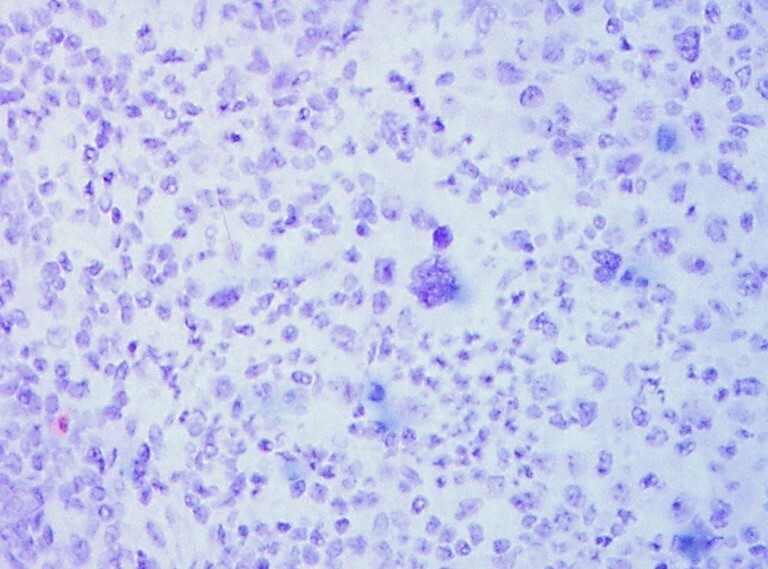 The negative keratin and EMA stains make carcinoma unlikely. 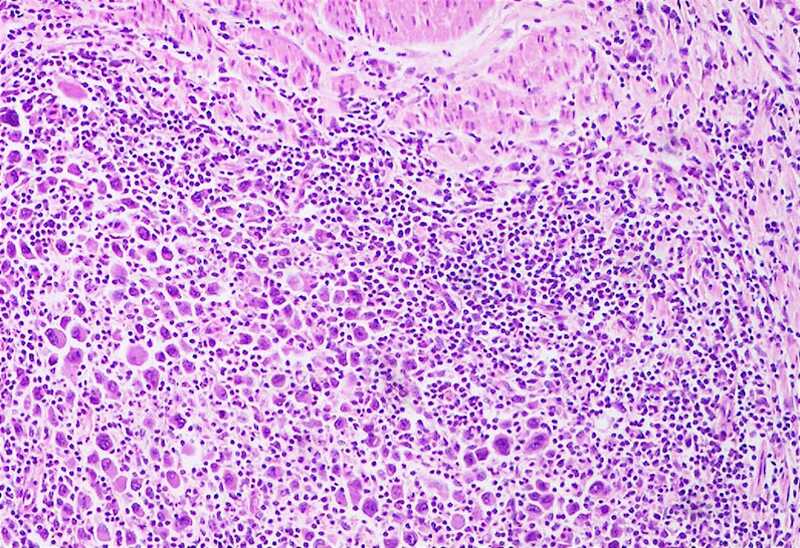 The initial differential diagnosis included grey zone lymphoma intermediate between DLBCL and Hodgkin, anaplastic large cell lymphoma and classical Hodgkin lymphoma, syncytial variant of nodular sclerosis subtype. 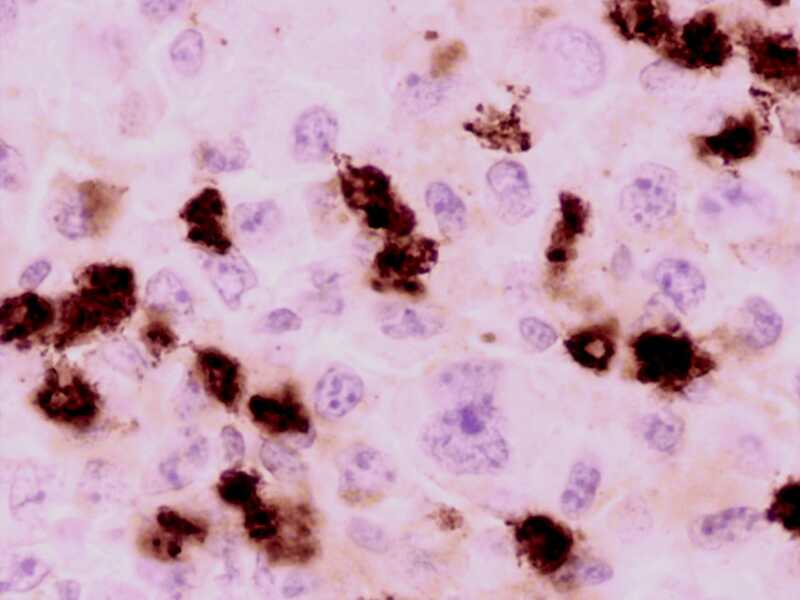 The case was sent to an expert (within India) and was diagnosed as classical Hodgkin lymphoma based on the background, morphology and immunohistochemistry. The case was then later discussed in the First Indian Cancer Congress, New Delhi in 2012-2013, with the same conclusion. 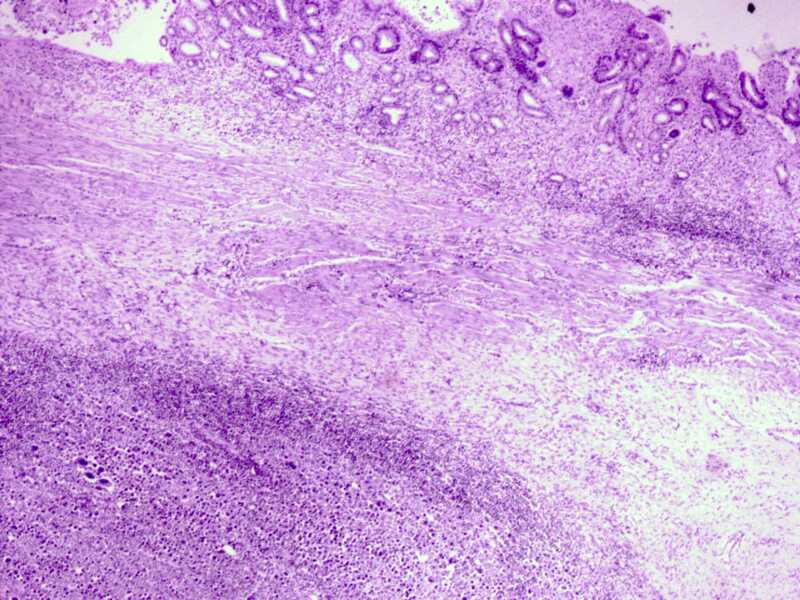 It is difficult to predict the prognosis of primary gastric classical Hodgkin lymphoma due to its rarity, but several case reports have suggested a poor prognosis, with 40 - 60% of patients succumbing to the disease within 1 year of diagnosis (Arch Pathol Lab Med 2002;126:1534).